Drug reference apps have become a go-to resource for healthcare professionals, with 46% of smartphone-using physicians accessing them at least once per week, and 26% daily. With so many choices, how do you know if the information you are referencing is accurate? The good news is the most trusted resource for drug information just received an upgrade this summer. Redesigned with the healthcare professional in mind, the new mobilePDR provides quick, easy access to the drug information you need, especially “when you’re on the clock, oncall, or on vacation” says PDR Chief Medical Officer, Salvatore Volpe, MD. 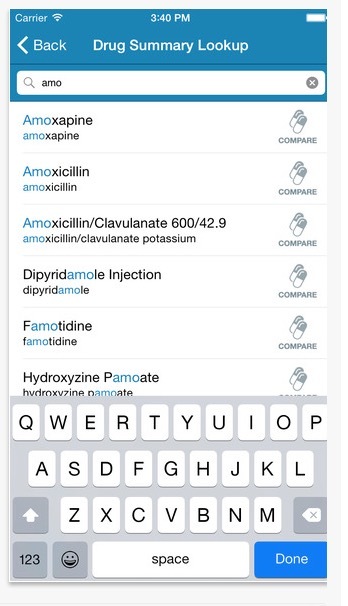 Amongst the enhancements, the new mobilePDR provides fast, one-tap access to powerful drug reference tools where you can search by brand, generic, or pharmacological class name. Plus, you can personalize the experience by saving searches for frequently prescribed drugs or access recent searches with a single tap. Leverage weight-based dosing recommendations and side-by-side drug comparison tools to make efficient and informed prescribing decisions by swiping left-right to quickly compare different drugs’ dosing, indications, and side effects. The app also features a color-coded drug interaction checker that immediately indicates the severity of interactions detected and provides detailed explanations to help identify which component to adjust. Another new feature of the updated mobilePDR is a drug identification tool which helps to quickly identify unlabeled pills, capsules, and tablets. Users simply input pill attributes such as imprint code, shape, color, or size and the app will provide a list of all matching drugs. Users can then visually confirm the correct drug with full-color photos within the app. In more good news, the app is 100% free for all U.S. healthcare professionals (registration required). PDR has been trusted by generations of healthcare providers to deliver innovative health knowledge products and services to support prescribing decisions. The new mobilePDR is no different. To download the app, please visit the Apple App Store or Google Play Store. ACA Database: Private Alternatives to Medicare?